Get ready to spot them, and other less common whale species, as you wind down the NSW coast, from Cape Byron State Conservation Area in the far north to Ben Boyd National Park in the south. Stop at the Coffs Coast, Port Stephens, Sydney and Jervis Bay. Marvel at the whales’ size and grace as they glide past panoramic coastal lookouts or get up closer on a whale-watching tour. Take a guided tour to learn more about the migratory paths, complex underwater love songs and acrobatic communication of these awe-inspiring creatures. You can drive this journey in sections or take a longer time to do its entire length. Experience the annual whale migration in coastal national parks between June and November. Find the perfect vantage point to enjoy the migration and plan your next coastal adventure at the Wild About Whales website. 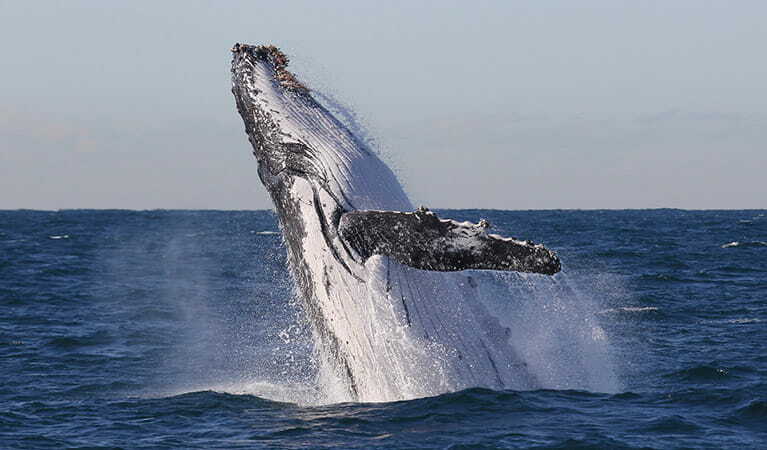 Start your adventure in Cape Byron State Conservation Area, which sits at Australia’s most easterly point and is a sensational location for whale watching. Follow the coastal walk to the Cape Byron Lighthouse, looking out for the majestic whales which often frolic just a hundred metres offshore. To get closer, join a whale watching tour or go kayaking from the beach. Spend the night in a classic beach cottage such as Partridge Cottage and Geoff's Shed or Thomson’s Cottage. Continue down the Pacific Coast to Coffs Coast Regional Park, where the Solitary Islands coastal track winds past rocky headlands that are perfect for whale watching. Don’t miss Arrawarra Headland and Woolgoolga Headland, which the locals have nicknamed ‘whale watch headland’ for a reason. Continue on to Bongil Bongil National Park, for a night in the spacious, self-contained beach house of Tuckers Rocks Cottage. Woolgoolga Beach and Headland has the best whale watching in the Coffs Region, plus great surfing, fishing and picnics and scenic views. Drive to the holiday haven of Port Stephens and explore Tomaree National Park, where the easy walk to the top of Tomaree Head offers panoramic views across the north coast and surrounding ocean. 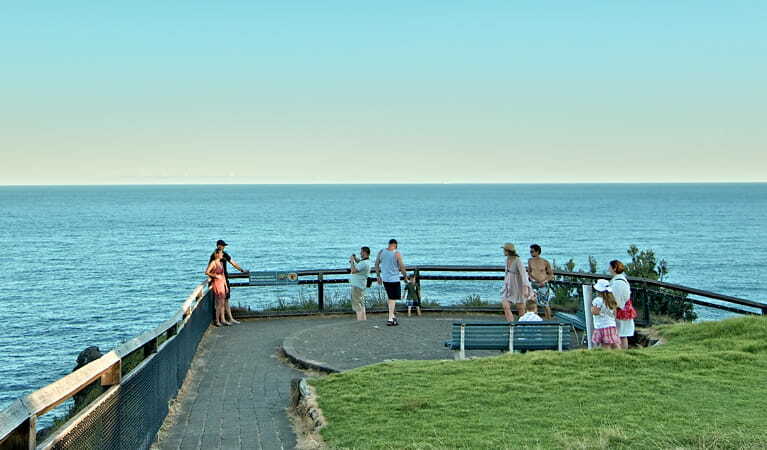 Stop at the picnic area for more chances to catch whales gliding past the headland. You can also spot the majestic mammals from Fishermans Bay foreshore, the Wreck Beach walk or in Worimi National Park, where you can see the huge Stockton sand dunes and camp on the beach. Take a guided tour along Tomaree Head Summit walk, absorbing views of Port Stephens and the north coast. When you reach the summit, enjoy a relaxing lunch on the bench by the lookout. The short walk to Wreck Beach offers a private alternative to the beaches of Port Stephens, with opportunities for picnicking and whale watching. Worimi National Park is a special Aboriginal place near Newcastle. Enjoy whale watching, fishing and beach driving on the Worimi Conservation Lands. Head into Sydney, where the harbour headlands and jagged coastline are lined with scenic vantage points. 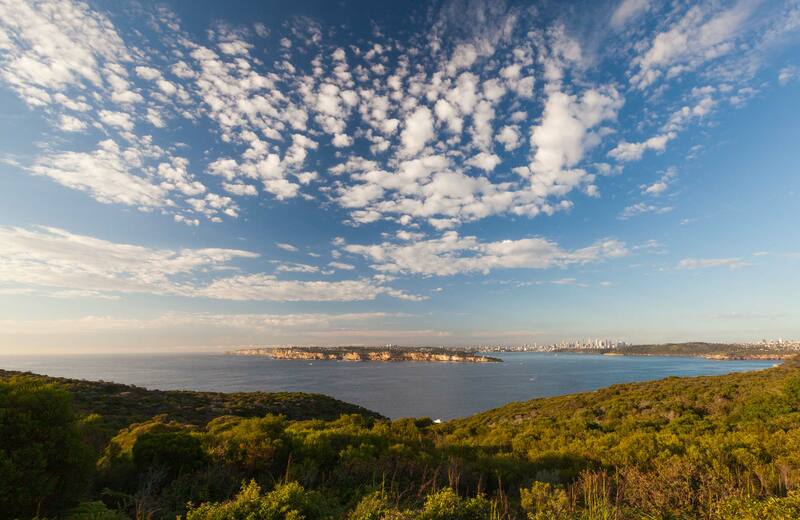 In Sydney Harbour National Park, check out Middle Head, North Head and Hornby Lighthouse near Watsons Bay. Further south, whales swim as close as 200m to Cape Solander in Botany Bay, one of Sydney’s best places to whale watch. If you stay around Sydney Harbour, book a night in charming Constables Cottage in Watsons Bay. Or continue south after Botany Bay for the tranquil riverside Bonnie Vale campground on the northern fringes of Royal National Park. Bonnie Vale campground is closed due to fragments of old asbestos-containing material coming to the surface. Visit this webpage for up-to-date information. Bonnie Vale picnic area and the boat ramp are open and safe for visitors. Middle Head is one of Sydney Harbour's seven headlands. 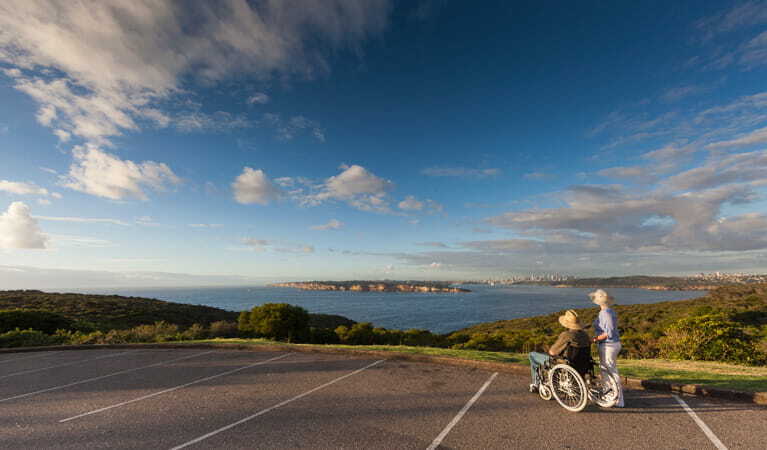 Enjoy scenic views of Sydney Harbour from the lookout or take a guided tour of the historic fort and military relics. Head to one of Sydney's best whale watching spots. Cape Solander, located in the Kurnell section of Kamay Botany Bay National Park is an unbeatable lookout during whale watching season. Continue south to Jervis Bay National Park, where each year, more whales are sighted in the calm, protected waters. Watch them from the deck of a charter boat or try your luck from the white sands of Hyams Beach. You should also check out Cape St George Lighthouse, Caves Beach and the Perpendicular Lighthouse. Spend the night in nearby Nowra. Hyams Beach trail, also known as the Bird Spotter’s walk is great for birdwatching in Jervis Bay National Park. Continue the walk to Seamans Beach for a refreshing swim. It’s a long drive to Ben Boyd National Park, near Eden, where the wild, rocky coastline is an inspirational place to whale watch. See gracious humpback whales glide through Twofold Bay and visit Davidson Whaling Station to learn more about the area's whaling history. In early November, this stretch of coast is backdrop for the Eden Whale Festival. Spend the night in Green Cape Lightstation Keepers' Cottage - heritage accommodation with breathtaking views. Ben Boyd National Park, near Eden, offers whale watching, fishing and beach camping. Stay in heritage lighthouse accommodation or enjoy the scenic Light to Light walk. Park entry fees apply (southern section only).